The special PS4 Pro has a mirror finish and is finished with the iconic Galactic Empire and Resistance emblems, as well as the emblem for the Inferno Squad, an elite Imperial task force featured in the single-player campaign of the game. You will also notice in the DualShock 4 different logos from Star Wars imprinted in the touchpad. The included Deluxe Edition of the game lets users play three days earlier than the Standard Edition, and also comes with premium digital content, including upgraded versions of all four trooper classes and instant access to the elite hero and Starfighter epic Star Cards. 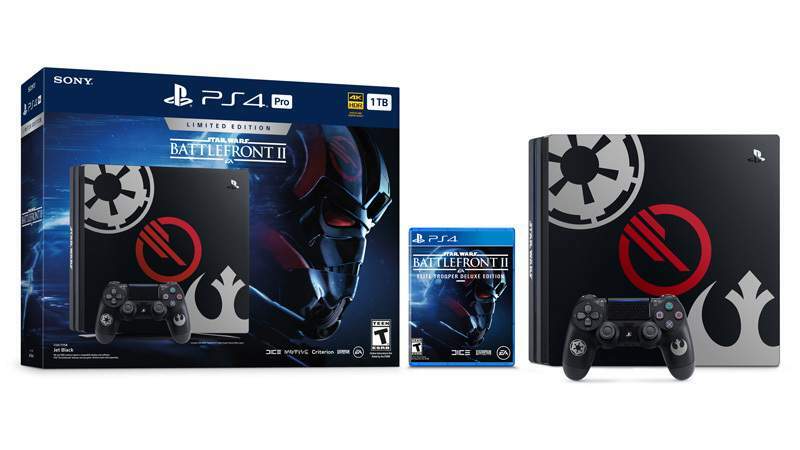 Sony is introducing an another Star Wars Battlefront II PS4 bundle, which you can pre-order from here that includes a Jet Black 1TB HDD standard PS4, DualShock 4 wireless controller and a physical copy of Star Wars Battlefront II Standard Edition. The Limited Edition PS4 Pro bundle will hit stores across the U.S. on November 14, 2017, for $449.99 USD. The Standard Edition will be available on November 17, 2017, for $299.99 USD.